CAED architecture alumnus Alfred “Weird Al” Yankovic (ARCH, 1980) earned another Grammy award on Feb. 10. This time it was for Best Boxed or Special Limited Edition Package at the 61st Annual Grammy Awards. Congratulations to Weird Al and his production team! Read more and view a clip of their acceptance speeches. 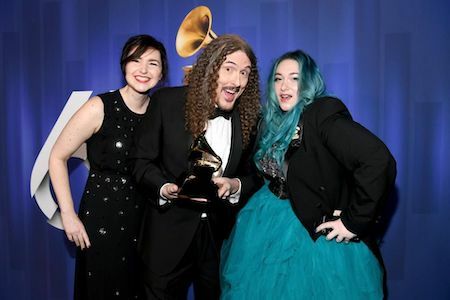 Yankovic shared the award for Squeeze Box: The Complete Works Of "Weird Al" Yankovic with Annie Stoll (pictured on left) and Meghan Foley (right), who joined him on the project as art directors, and backstage at the Grammys during the pre-telecast portion of the ceremony.